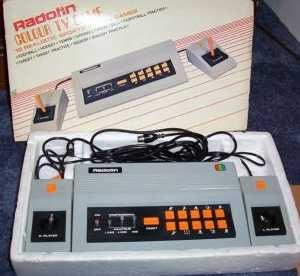 The first console my family purchased was a Radofin Colour TV Game system in 1981. The fancy specifications of this machine were proudly displayed on the box, and included boasts of "full colour" and "3 sound effects". Heady days indeed! Even back in 1981 the machine was limited, and although I was initially excited at being able to play 10 different games in the comfort of my own home, this soon dissipated as I quickly realised that the games were extremely similar to each other. The other problems were that the games on the system were crap, and really, all I wanted to place Space Invaders, and this machine could only reproduce poor renditions of sports titles. Due to high cartridge prices, and the fact that home computers pretty much ruled the roost in the UK during the 1980s, this would be the last console I'd own until I purchased a SNES around 1993. To me, the Super Nintendo felt absolutely groundbreaking, and since then my main gaming platforms have always been consoles. I did try PC gaming between 1997 and 2000, but to be honest I found optimising the games to run such a faff that I relegated the PC to work and web browsing. Originally released in Japan in November 1990, it would take almost 18 months until Nintendo's SNES reached UK shores.